​ if you cant make the class ,you can find someone Else to take your place or you can be put on a list for the next class. This class qualifies you if you want to purchase handguns in the state of Hawaii. This class will teach you how to own and use a handgun safely. We go over all the safety rules, the basics of pistols and revolvers, ammunition basics, shooting fundamentals, firearm safety in the home, and the Hawaii firearm Laws. The class costs $150 and includes all materials. We provide guns and ammo for use during class training. Each student will receive a Notarized affidavit that is required by the state of Hawaii for handgun permits to purchase handguns not to conceal carry. The first half of the class is classroom training and testing. The second half includes live fire training. Please pack a lunch as we will take a short lunch break and there is no food available for purchase. A four wheel drive vehicle is recommended as the class is at a local ranch just up the hill and the access road is a little bumpy, cars will make it and four wheel drive is not needed but recommended as you can drive all the way in to the shooting area, cars will park at entrance of ranch and carpool in about 500 yards . The entire course runs about 6 hours. Classes are held once a month from 9am to about 3pm. ​ You must fill out a registration form & pay for the class in full $156.25 total. Please make sure you can make it to the class, there is a high demand , we will fill classes each month and we will have to turn people away and thats the reason we have to be strict with the payment, we were getting to many cancellations and we have many other customers that would've loved to take that seat and we can't afford to lose those seats. If you are signed up and cant make it, you will lose your payment, you can find someone else to take your spot in the class or we can add you to a standby list for the next class if someone else cancels, standby is not guaranteed. We do not take credit cards, debit cards or checks for classes sorry, visit our store to sign up. Space is limited and classes fill up quickly so sign up today! This is a great class for women and beginers, no experience needed. You will leave this class confident that you will be able to handle a handgun safely. 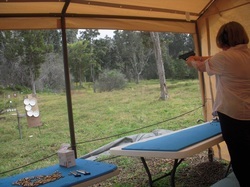 Professional instruction from certified Hawaii pistol Instructors.